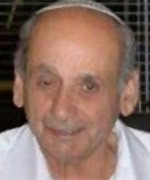 Oct 13, 2015 - Chaim Haviv, 78, of Jerusalem was killed in a combined shooting and stabbing attack on Egged bus 78 in the neighborhood of Armon Hanatziv (East Talpiot) in southern Jerusalem. Shortly after 10:00 am, two terrorists, both Jerusalem residents from adjacent Jabel Mukaber, boarded an Egged bus in East Talpiot (Armon HaNetziv), one armed with a gun and the other with a knife. They started shooting and stabbing passengers. A security guard at the scene was able to overpower and shoot one of the terrorists. The second locked the bus doors in an attempt to stop security forces from boarding, as well as stopping passengers from fleeing. Policemen opened fire at him from outside the bus. Chaim Haviv and his wife Shoshana were on their way home from the local health clinic when the terrorists attacked the bus. Chaim was killed; Shoshana was seriously wounded and remains in intensive care. They were a quiet couple who had moved to the East Talpiot neighborhood only a few months ago. Chaim Haviv is survived by his wife Shoshana, five children and many grandchildren.